The Reggae Girlz made history by becoming the first Caribbean country to qualify for a FIFA Women’s World Cup. The 2019 FIFA Women’s World Cup is scheduled for June 1 – July 1, 2019 in France. The Reggae Girlz will take on Brazil on June 9th, Italy on June 14th and Australia on June 18th during the Group Stages. The JWNT will begin their 2019 World Cup Send-Off Tour with a game in Jamaica against Panama on May 19th. The organizers are pleased to announce the Reggae Girlz Foundation (RGF), City of Miramar and the Vice Mayor Alexandra Davis will be hosting the Reggae Girlz on the second stop before they depart for Europe, with a week of celebration activities from May 20th through to the 24th. In addition to his nine Olympic Games gold medals Usain won eleven World T&F Championships titles. He completed the 100m, 200m and 4x100m sweeps at the 2009 World Championships in Berlin, 2013 World Championships in Moscow and 2015 World Championships in Beijing. He won the 200m and 4x100m at the World Championships in Daegu in 2011. Usain currently holds the world records in the 100m, 200m and 4x100m with times of 9.58 secs, 19.19 secs and 36.84 secs. His first world record was in the 100m in 2008 when he posted a time of 9.72 secs in New York. He lowered it to 9.69 secs at the 2008 Olympic Games in Beijing and then to 9.58 secs at the 2009 World Championships in Berlin. He holds the three fastest times ever run 9.28, 9.64 and 9.69. Also in 2008 in Beijing he set a new 200m world record taking 0.02 off Michael Johnson’s previous mark with a time of 19.30 secs. He lowered this time further to 19.19 secs in Berlin in 2009, a time which may stand for years to come. On the world all-time list Usain holds five of the top ten times ever in the 200m. As part of the Jamaican 4x100m team Usain broke three world records – 37.10 secs in Beijing in 2008, 37.04 secs in Daegu in 2011 and 36.84 in London in 2012. Jamaican teams with Usain have the seven fastest 4x100m times in history. Usain has been awarded the Laureus World Sportsman of the Year on four occasions (2009, 2010, 2013 & 2017); the IAAF Male Athlete of the Year six times (2008, 2009, 2011, 2012, 2013, 2016) as well as many awards in many countries in all corners of the world. 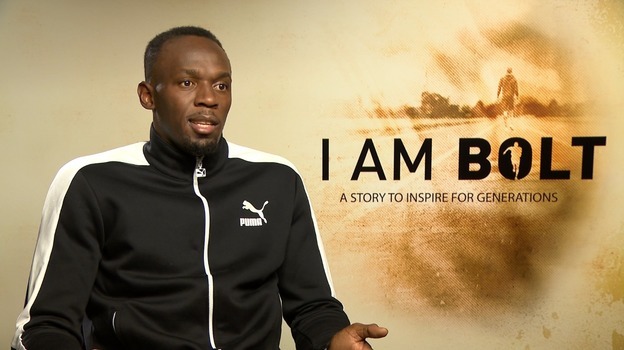 He has his own clothing line in conjunction with Puma; his own watch made by Hublot; his own restaurant ‘Tracks & Records’ in Kingston, Jamaica; his own shaving company Champion Shave, his own insoles company Enertor; the ‘Usain Bolt Foundation’ and endorses some of the top brands in the world. Nico Marley (the grandson of Jamaican reggae legend Bob Marley) has been accepted into the NFL; America’s National Football League. Nico was signed by the Washington Redskins as an undrafted free agent after trying out for the team during its rookie minicamp over the weekend. It is worth noting that his father, Rohan, was a linebacker at the University of Miami from 1992-1994. As part of ongoing preparations for the annual Penn Relays, Team Jamaica Bickle (TJB) recently launched its 2016 season at a private reception held at the Jamaica Pegasus Hotel in Kingston on Monday, March 21. A twenty-member team traveled to the island to the annual ISSA/Grace Boys & Girls Championships, which ran, March 15-19 at the National Stadium, before hosting the launch the following Monday. Among the guests were: Minister of Education, Youth and Information, Hon., Ruel Reid; Mr. Ali McNab, representing the Minister of Sports, Culture and Gender Affairs, Hon., Olivia ‘Babsy’ Grange; Mr. Ryland Campbell (former CEO, Capital & Credit Merchant Grant); Mr. Christopher Barnes, General Manager, The Gleaner Company; Dave Johnson and wife Jane Bunting, UPENN and from the Inter School Sports Association, (ISSA), Dr. Walton Small and Mrs. Coleen Montaque. In bringing greetings to the audience, Minister, Ruel Reid, spoke of his admiration for the organization and the work it’s doing and wished for its continued success. TJB’s Special Guest, Stephen Drummond, Esq., who is based in New York, presented a check for USD $10,000 to the organization. He also announced a major financial boost by his law firm, DRUMMOND & SQUILLACE, PLLC to Herbert Morrison (of which he’s an alum) to provide free lunch for one year to the entire student body. Now in its 22nd year, TJB has over the years formed numerous strategic partnerships to support not only athletes but the schools from which many of them hail. Support for athletes at the annual Penn Relays Carnival, held at the University of Pennsylvania in Philadelphia, includes, meals, transportation, booking and coordinating hotel accommodation and chiropractic care. Dervan Malcom, host of Power 106 FM and the extremely popular “Diaspora Live” Program was presented with the Team Jamaica Bickle Award for using that platform to give the Diaspora a greater voice. The Penn Relays will be held, April 28-30. Four very talented Jamaican born sprinters, who reside in the United States (USA), answered the call, rose to the occasion and carried the black, green and gold proudly by setting a National Record in the 4 X 200m contest with the time of 1 minute and 25.69 seconds. In an atmosphere similar to Penn Relays, a vast crowd celebrated as Jamaica won ahead of USA (2nd), Dominican Republic (DR, 3rd), Guyana (4th), Trinidad & Tobago (5th), and France (6th). The eclectic Jamaican team is comprised of all college graduates, including, Romel Lewis from Maryland (starter); Kevin Thompson of New Jersey (2nd leg); Rayon Lawrence of Maryland (3rf leg); and Rushane Scott from Las Vegas (anchor). They met just two days prior, practiced less than one day and ran as a team for the first time. Regardless, their baton change was flawlessly executed. Coach Evans is a former athlete of Jamaica and University of Arkansas, a member of Team Jamaica Bickle and recipient of numerous awards in New York including one from the Union of Jamaican Alumni Associations (UJAA). He has traveled worldwide as one of Jamaica’s national coaches and New York liaison for JAAA. On Sunday March 6th, 2016, the highly anticipated Annual Cricket Legends Weekend will take place at the Central Broward Regional Park in Lauderhill, Florida. The Exhibition Cricket Match will feature such Legends as “The Great” Barry Richards (South Africa), Lawrence Rowe (Jamaica), Joel Gardner (Barbados), Augustine Logie (Trinidad), Faoud Bacchus, Lance Gibbs, Ramnaresh Sarwan (Guyana), Desmond Haynes, Rohan Kanhai, Alvin Kallicharran with many more legendary cricketers to be announced. Since 2011 the Lawrence Rowe Legendary Cricket Foundation’s, “Mission of the Heart” have been extending a helping hand to W.I Legends across the Caribbean. Also through their “Look Good Do Good” program the foundation has been educating the youths and community about the Caribbean Culture, through the sport of Cricket, creative expression, as well as providing tutoring for children 7-14 years of age. The foundation has traveled throughout the Caribbean, North America and England educating the youths of tomorrow and teaching the dynamics and makeup of the sport of Cricket.